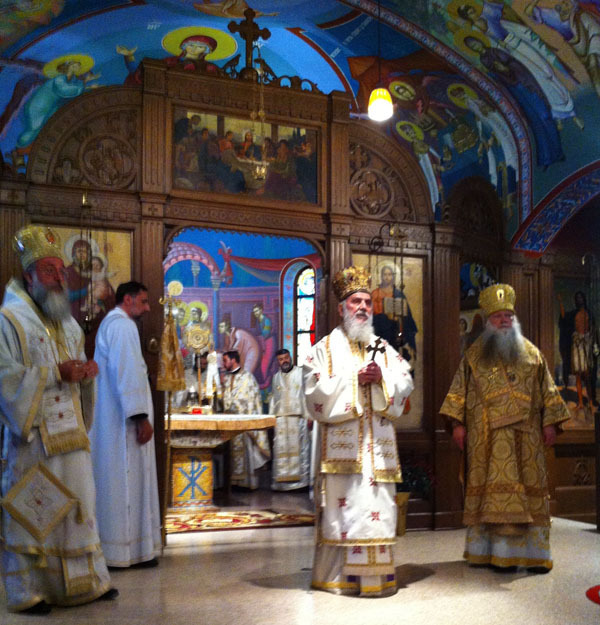 Libertyville, IL - On Saturday, August 11, 2012, on the day of the 70th anniversary of the "St Sava" Children's Camp His Holiness Patriarch Irinej officiated at the Holy Hierarchical Divine Liturgy in the overfilled church, the stavropighial monastery of St. Sava in Libertyville, with the concelebration of His Grace Bishop Longin of New Gracanica and Midwestern America and Bishop Peter of Cleveland (Russian Church Abroad), as well as priests and deacons. At the conclusion of the liturgy, His Grace Bishop Longin cordially welcomed His Holiness. 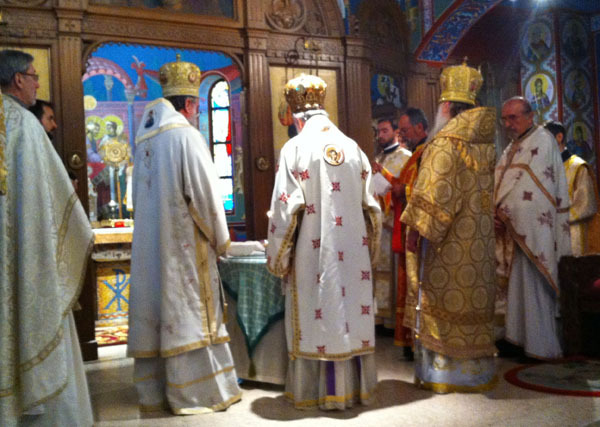 Bishop Longin stressed the importance of His Holiness' presence in these regions since he himself, the first hierarch, is the symbol of unity of the Serbian Church and Serbian people. 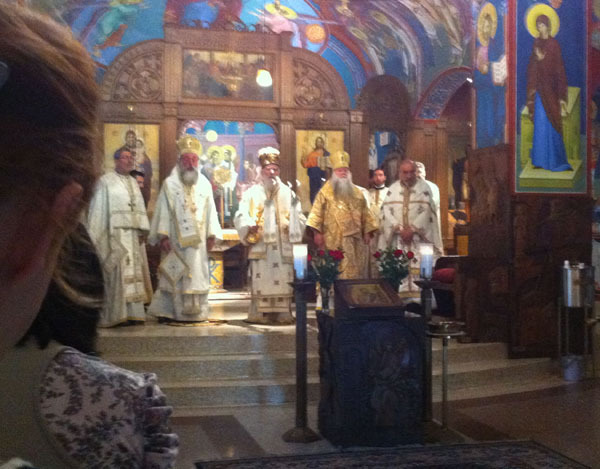 His Holiness, then, filled with fatherly concern and love addressed the many faithful gathered, pointing out the importance of the St. Sava Monastery as the oldest Serbian spiritual center on the American continent, stressing the special role the monastery played in preserving unity among the Serbian people in these regions throughout history. The patriarch particularly stressed the tie between this monastery and our Serbian rulers, whose bodily remains are at rest in this holy place. His Holiness, in his address, said that it was good that there is a Committee and Circle of Serbian Sisters which will worry about the upkeep of this, America's oldest Serbian holy and spiritual site. At the end, His Holiness turned to the need in preserving our language and national identity on this continent, and the children camps are a good opportunity for the nurturing of language and Serbian culture. Following the Divine Liturgy an agape meal was served. The meal was prepared by the group of volunteers and donors "The Myrrbearers of the Stavropighial Monasery of St. Sava - Mother Angelina". During the program the children were introduced who participated in the summer camp, demonstrating what they had learned during their stay at the camp.